Article Highlight: How Many Carats Should an Engagement Ring Be? Knowing engagement ring basics will help a couple find the perfect ring with minimum complications and confusion. Because an engagement ring is such an important investment, it is crucial to be fully aware of each aspect of the ring while investigating different options. The jewelry industry is replete with vocabulary, and knowing the proper definitions of basic terms will help couples have educated and informative discussions with jewelers as they examine different engagement rings. Setting: The way the diamonds or other gemstones are arranged on the ring and how they are held together. Design: The overall look of a ring, including the setting, colors, and stone arrangement. Appraisal: An unbiased, professional evaluation of a ring's financial value and overall condition. Certificate: Authorized documentation that stipulates a diamond's condition, including its dimensions, quality characteristics, and other features. Cut: The shape given to a diamond based on how different planes interconnect. Many jewelers use the words cut and shape interchangeably. Shape: The physical shape of a stone after it has been cut. Round is the most popular shape for engagement rings. Clarity: The degree to which a stone lacks flaws, inclusions, or other imperfections. 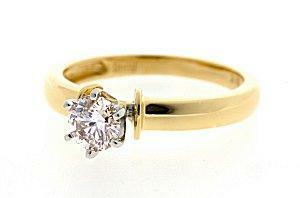 Carat: The overall weight of a stone and one of the main factors in determining an engagement ring's cost. Color: The hue of a diamond or gemstone, often used to ascertain the stone's perfection and value. Band: The part of an engagement ring that encircles the finger, often embellished with accent stones, engraving, or other details. Solitaire: A ring with a single stone, typically a diamond, rather than an arrangement of multiple stones. Bridal Set: A set of two or three rings that includes not only an engagement ring, but matching wedding ring for the bride and possibly the groom. Wrap: A type of enhancer that fits around solitaire rings to add accent stones. Promise Ring: A simple ring, typically less valuable than an engagement ring, often used to cement a relationship without an official engagement. Once a couple is familiar with engagement ring basics and terminology, they can consult a jeweler to view styles, designs, and shapes that suit their style preferences and budget. By being an informed consumer, they will know more about the market and options available, giving them the opportunity to find the perfect ring to symbolize their relationship.